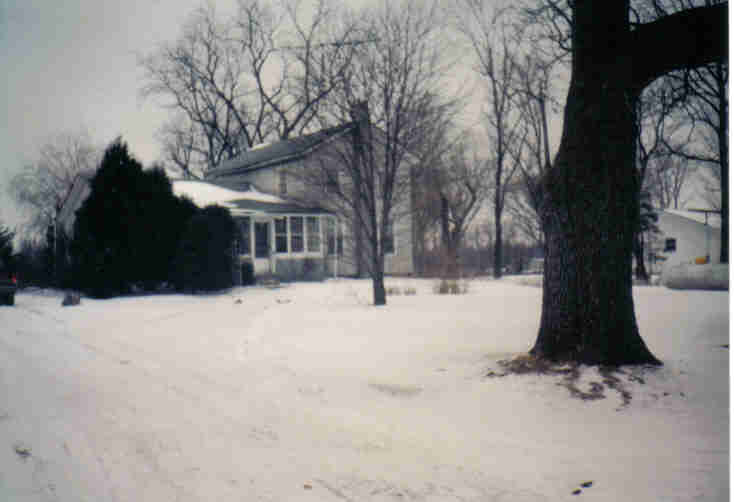 We always called my Grandparent’s house “The Farm.” Purchased in the early 1940’s, it was home to their six children and their home until they died. It was a beacon of love for the growing extended family and housed not only holiday celebrations, but an every Sunday family tradition during the school year when everyone gathered for Sunday afternoon football, games of euchre, and heaping helpings of Grandma’s goulash, green beans, corn and homemade bread. The house was already old when my Grandparent’s bought it. The stone basement walls, the tree-timber beams and hand made nails presumably were produced from the land itself. When my mother lived there as a child it was heated by a wood stove in the kitchen. Water was hand pumped from a well in the backyard. There were no indoor toilet facilities and baths were taken in a galvanized laundry tub with water heated on the stove. Modern plumbing didn’t happen until around 1948. Heat was provided by a coal burning furnace during most of my childhood, only replaced with a modern furnace under Grandma’s extreme protest some 40 years later. The 10 acre plot of land ran all the way down to the river, and hosted a pine forest, planted by my Grandmother in hopes to sell Christmas trees. They quickly grew to a tall dense forest, but supplied fresh trees for most of the family every year. All that remained of the original apple orchard was one surviving tree in the cow pasture when I was a kid; the rest destroyed by frequent lightening strikes. Several black walnut trees grew in the backyard, producing smelly green balls that turned your hands black. Grandpa used to gather them and strew them in the driveway, collecting the treasured nuts once the hulls broke down. Winter nights were spent digging the meat from the shells as he listened to the radio or watched television. My earliest memories of “The Farm” included an old wooden barn, which blew down in one of Michigan’s violent windstorms. It was replaced by a neat cement cow barn, with one large box stall for Grandma’s pet cow, Josie. There was a pen for Petunia, the pig, next to the run where my Uncle’s hunting dog Judy lived. Freddy, the shaggy farm dog, lived in a doghouse under one of the walnut trees. I grew up drinking fresh raw milk, straight from the cow, and strained through a cheesecloth and enjoying the best home-made dill pickles on the planet. Grandma grew a huge vegetable garden and filled the land around the house with giant, brightly colored flower beds. She cursed the weeds and worked the loamy black soil early every morning. Afternoons were usually spent canning, using her produce to host Sunday family meals. “The Farm” and the people who lived there formed me. Although they are long gone, their memories live on. I still make Grandpa’s favorite cake, a yellow sheet cake frosted with vanilla icing and topped with shredded coconut. One bite takes me back to visits in Grandma’s sunny kitchen, listening to the grown ups talk and playing with Grandma’s ever present kittens. Gingerbread Windmill cookies have the same effect. Grandma carried most of her recipes in her head and shared her knowledge as special gifts. I treasure her baked beans, mushroom and cabbage, and potato salad recipes. One bite is all it takes to erase the years. Like her, I am an avid home canner and love to cook from scratch, just as Grandma did. And, I love having a cat.